Whenever my husband asks me what needs to be done to his car, instead of rummaging through our filing cabinet, I can now just open up my RepairPal 2.0 app on my iPhone and show him! Ever since my husband began traveling for work, I’ve been put in charge of a few of his old “duties” around the house – like taking out the trash and maintaining our vehicles. As it happens, both of our cars – a 2004 Pontiac GTO (Goatie) and a 2006 Saturn Vue (Sally), are no longer in production. That means that it’s more important than ever to take exceptional care of them and keep them in tip-top shape. With everything else on my plate, keeping track of our vehicle maintenance and finding the right place to take them for that maintenance can be quite a hassle. Luckily, RepairPal 2.0 should change all of that for me! 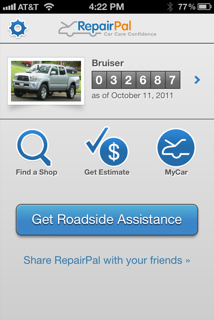 The RepairPal 2.0 Mobile app sells for US$4.99. 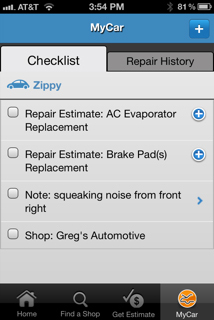 Click here to purchase the RepairPal 2.0 Mobile App or to learn more about it. Not only is it a great application to find service shops and get estimates on repairs and maintenance, it is also a great way to keep track of your scheduled maintenance. You can actually save more than you paid for the app the first time you use it to locate a service station and compare estimates from the ones around you! It is really easy to use! Just enter your vehicle information in the Repairpal 2.0 app. The standard info is all that is required: make, model, year, number of miles. Of course you need to give your vehicle a nickname in the app! And you can enter more than one car if you need to, which was perfect for me. Also? one of the features I love the most is that you can look up the scheduled maintenance requirements for your vehicle through the app! When it’s time to schedule maintenance on your car, you just look up the service you are interested in using your zip code. You can choose service stations, dealerships or “all” within 5, 10, or 25 miles – it’s up to you. RepairPal 2.0 will give you a list of service stations to choose from and when you make your selection, it gives you an estimated price for your desired repair or service. What I really love about this estimate feature is that not only does it tell you the price range you can expect, but it also tells you what is included in that price! For instance, I need to get an oil change on both of our cars, so when I pulled up the estimate on RepairPal 2.0, it told me that at my desired service station (Tire Kingdom), I should expect it to include the new oil, drain plug gasket and oil filter. While there were a ton of service stations within a 10 mile radius of my home, I chose Tire Kingdom because RepairPal 2.0 showed that they had the lowest estimate by $7.00! Another great feature of the RepairPal 2.0 app is that people can add reviews to service stations and you see the highest-rated options first! See how easy it is to keep records? 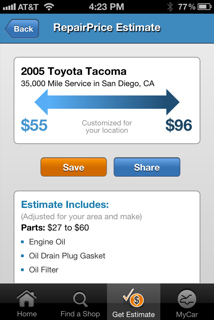 Each time you get an estimate, you can save it to MyCar, then check it off once the service has been completed. You can even make notes, like the one in this photo, if there is something you need to remember to tell your mechanic! Because everything stays in your history within the RepairPal 2.0 app, you have a great record of everything you’ve done to your car! I’m hoping that I don’t have to use the Roadside Assistance option anytime soon, but it’s quite a relief knowing that it’s there, and I only have to pay for the Roadside Assistance services if I use them! I was selected for this sponsored review by the Clever Girls Collective and received the RepairPal 2.0 Mobile app for free. To learn more about RepairPal 2.0, please visit their wesbite. That’s so much better than my lost receipt method! I don’t have an iphone but I have an Ipad and I like this app a lot! Lord knows I dont’ remember repairs and maintenance. That is a very interesting app. I will have to look into that one. That would come in handy so you can get an idea of what the cost of repair will be before you get there.